Hey everybody, what’s going on? As you may or may not know, I am an Extreme Couponer. Inspired by the show, Extreme Couponing on TLC, that my former housemate and I would watch with her dog, cat and some booze. The show would show men and women across this great country of ours exploiting the coupon policies of supermarkets across this great country of ours. They would walk out of the store with a thousand dollars worth of food, having only spent a few dollars or sometimes nothing. It was insane. At first I was like “that’s really cool, but wtf do I want with all of these Airheads and Fruit Roll-ups they’re procuring? Then my girlfriend went away for a weekend, and I started reading up on it. And it turns out you can get all kinds of food with coupons, from Organic Milk to meat, the sky truly is the limit. In the last 4 months I have bought nearly $2,000 dollars worth of groceries for less than $100. Now that I am back on the TNT Wagon, I want to score some deals on low carb stuff or things that would be Plan A approved. I thought I would share what I have found here on this blog today; although there are a few items that are not Plan A approved, but maybe you’d be interested. You can click the links to be whisked away to the coupons, themselves. When printing a coupon online, you’re limited to 2, typically. I’ll print coupons at my girlfriends house, my apartment, off my iPhone, etc. It really adds up. When you see something like SS 11/6/11 it means that the coupon could be found in the Smart Source insert found in your local paper on that date. RP is Red Plum. One item I am fired up about is the Hatfield Ham Steaks- which are actually pretty good. They are on sale for $2.00 a piece at King Kullen; which doubles coupons up to $1.00, so they are free. I was able to order 20 of those coupons off of Ebay for $3.99. So I’ll be getting 20 of these ham steaks at a low cost. Also, these stores, except for Target, double all coupons up to $0.99 cents. So for example, a $0.75 cent coupon will be worth $1.50. *Requires a Manufacturers coupon and Target store coupon. 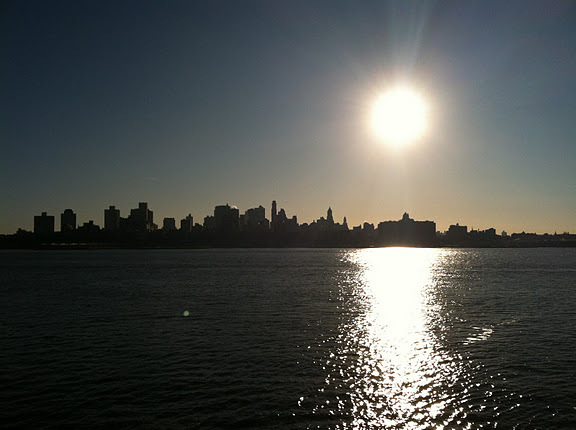 This entry was posted in Uncategorized on December 30, 2011 by TomTheBlogNY. 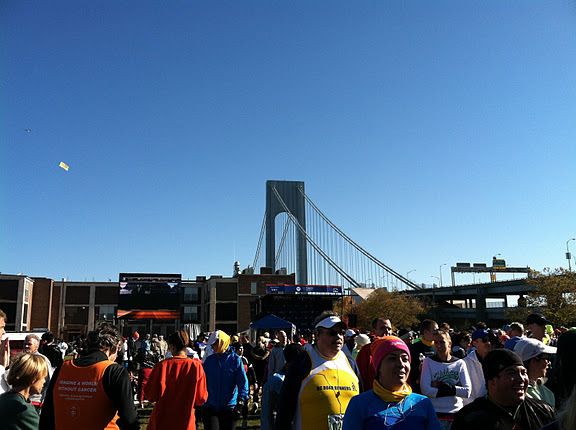 NYC Marathon- November 6, 2011. 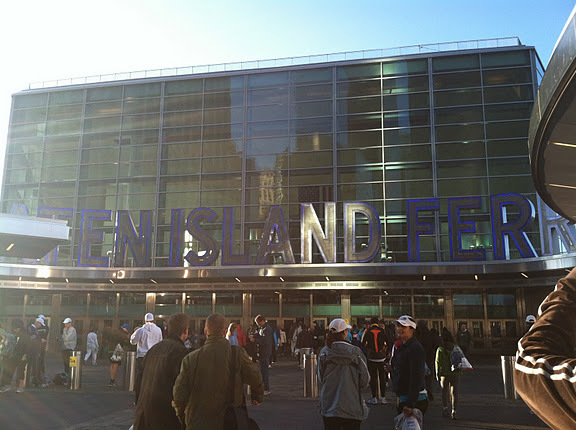 When I started dating my girlfriend, who is also a runner, it was around the time that the lottery opened up to join the 26.2 mile NYC Marathon through all the boroughs of New York. I told her that I had this unshakable feeling that we were going to get picked, but she was not as certain seeing as how she had been denied for the last two or three years. Despite my hunch, we were not picked, but three weeks before the race her friend and husband offered her and I their entries (they “won” the lotto) at face value. “Are you sure,” she asked them. “Umm, the race is in three weeks and neither have we- but we’ll definitely take them,” she said. So even though we didn’t get in through the lottery, my unshakable feeling about running this year’s NYC Marathon was, in the end, correct. Get a qualifying time in a qualifying race, aka. be Kenyan. 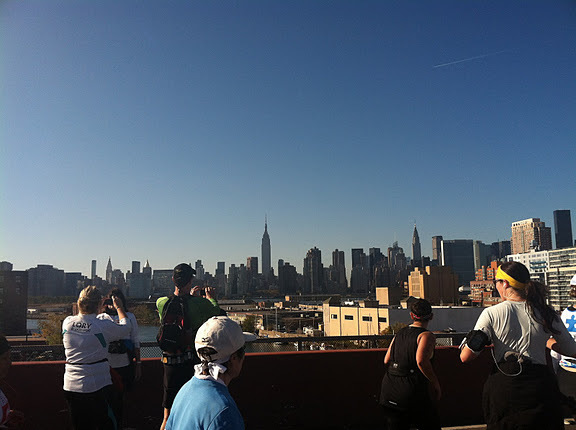 Run 9 NY Roadrunner Races that year. So her and I were under-trained- to say the least, though we had run the Walt Disney World Wine and Dine Half-marathon a month prior, and we just ran the three weeks leading up the race like any other training period, 50-60 miles a week, minus the taper. 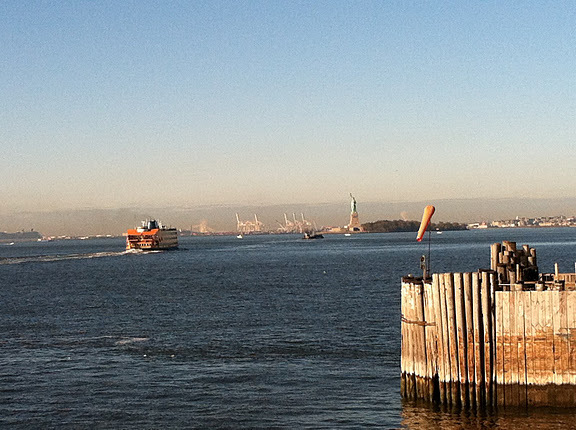 Stepping off the ferry and into Staten Island, you board a bus and head to the starting point. 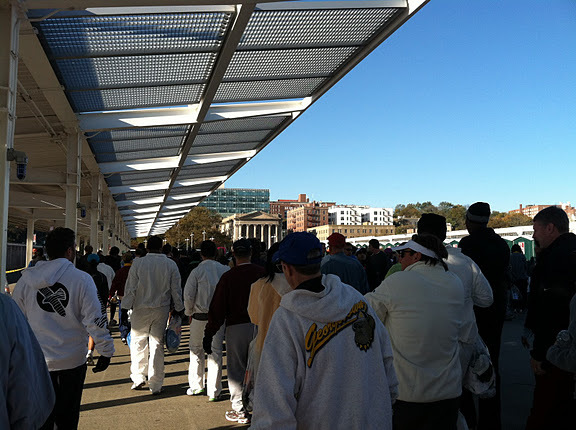 The Verazzano Bridge- seeing it on television is impressive but being a part of it is even more amazing. 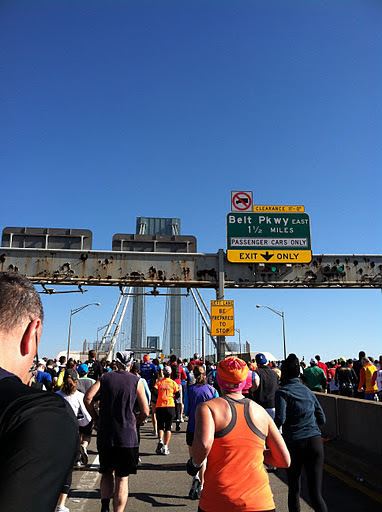 The most jarring part about running on the bridge is thinking that the signs posted are for you, “must stay in lane,” “merge ahead,” when really they were put their for cars. It’s not likely that the architects of the bridge ever thought people would be embarking on a 26.2 mile journey by foot, willingly, on this metal masterpiece. The cannon goes off and Sinatra’s New York, New York blasts from the speakers- off you go! After Staten Island you’re led into Brooklyn, more specifically Bay Ridge, Brooklyn, and people are cheering you on like they were watching the Olympics. Everyone wants to give you a high five, cookies they made, water bottles, all kinds of stuff- this permeates throughout every part of the city- you are never greeted by an empty street at any turn. Despite having put well over 1,000 miles on my 6 pairs of Brooks running shoes this year, I don’t consider myself a runner because, well, I hate running. But I love the races, and this one was without a doubt the most inspiring that I have been a part of. Everywhere you looked you had people wearing shirts that said “first marathon,” or “running because I’m not letting cystic fibrosis stop me,” “running to cure AIDS,” “Running to leave the old me behind me.” It may sound cliche or whatever but this is what running a marathon does- you don’t finish the person that started- I always finish a race with a different level of focus, but this time I finished with a different level of appreciation for many things. 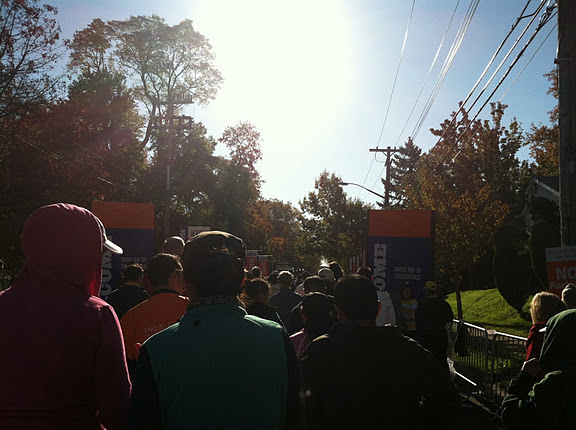 At mile 18, I hit what runners call the proverbial wall. Where you either just think you can’t finish, or you’re pissed off about something, or whatever- for some it comes at mile 21, 23, whatever- mine came at 18. I just didn’t care if I finished. I wanted out, but you man up and carry on- what did it for me this time was a woman that had a shirt on that said “running for my son. 1/7/84-11/9/2010- my birthday is 1/2/84, so if that wasn’t a sign, I don’t know what is. It doesn’t make your feet hurt any less, but at least you can appreciate that you’re alive to feel them hurting, right? Right. My girlfriend was running wearing a Team in Training shirt- a group that her and I work with to raise money for the Leukemia and Lymphoma society doing athletic events. A runner in his 70s came up to her and said, “I just want to thank you because I have melanoma and you might be saving my life,” and then he blew right by us. 😉 Crazy stuff. 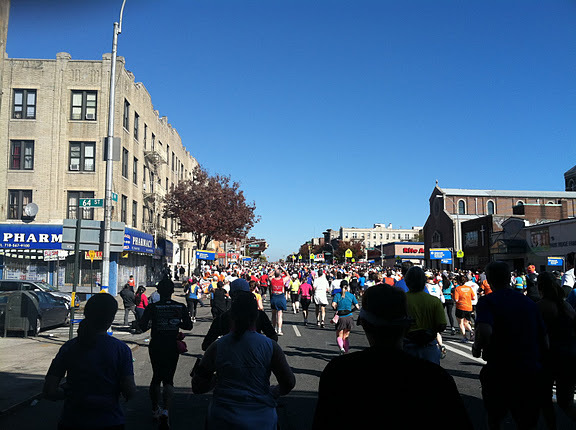 The best part of the race- besides burning 2,600 calories and the dinner at the UWS’s Salumeria Rosi Parmacotto that followed it- was all the unofficial entertainment that went on around you- every block there was something different- an Asian drum band in Long Island City, Reggaeton groups in Brooklyn, rappers all over the Bronx- it’s an event that only brings out the best in people. 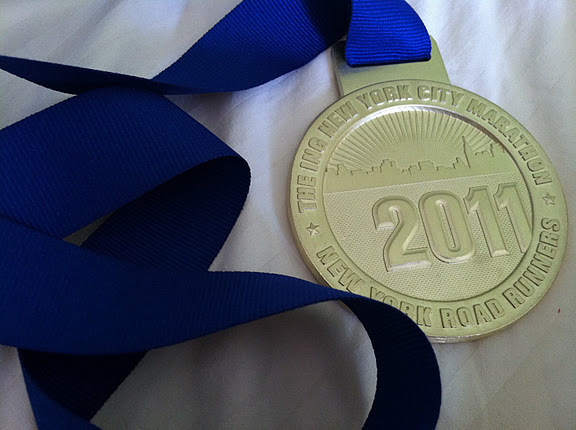 This entry was posted in Marathon Stuff on December 12, 2011 by TomTheBlogNY. If you think you need this book. 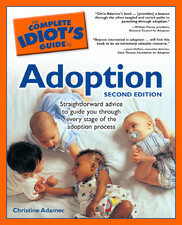 Unless of course this book is about adopting highways. In that case, by all means, go for it. 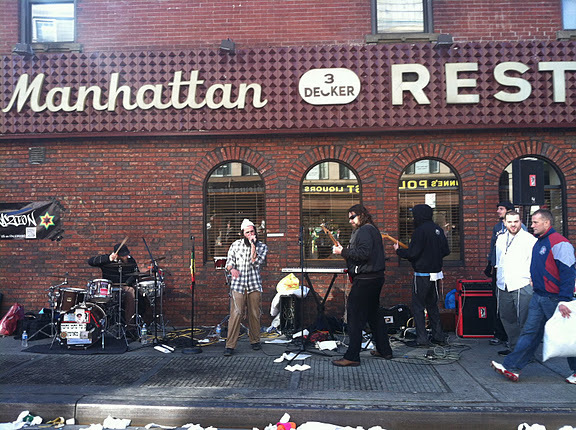 This entry was posted in Uncategorized on December 12, 2011 by TomTheBlogNY.